While I love our life and home in Oklahoma, our original home state of Utah still holds a special place in my heart. We've been lucky enough to be spending the holidays with family in Utah, sipping hot cocoa, chatting in comfy jammies by the fire...AND going to my favorite stores!!! I can't tell you how many times I've considered making the 4 hour drive to Dallas just to visit some of these places. And here they are, all in one place! Ahhh, isn't that a beautiful sight? Yes, the mountains are lovely, but just look at that big yellow sign? Those of you who don't live near an Ikea know what I'm talking about. Here's a closer one in case you missed it (yes...I'm aware I'm a dork). Look at this cute little living room. The most expensive item in there is the sofa and that's only $499. 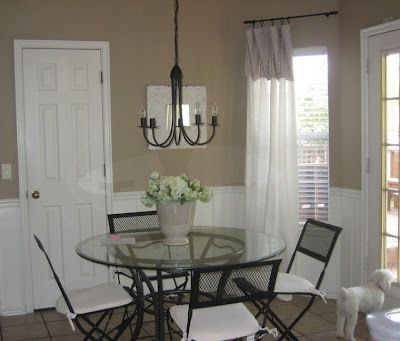 I bought this chandelier here last Summer and brought it home in my suitcase. Can you see that price tag? $34.99! Here she is in my kitchen. I was pretty proud of myself when I installed her myself. This dresser really wants to go home with me and hang out in my bedroom. I don't think she'll fit in my suitcase though. But seriously, wouldn't she be perfect with my other dresser? They even sell fabric! I'll be making pillows from the blue and white stripe...or maybe the blue/white windowpane fabric...I bought them both. And don't get me started on Anthropologie. I could marry this store. While Anthro is ridiculously expensive, and I can rarely afford to buy things there, it's still my favorite. I mostly look to her for decorating inspiration. I hope you all have a very Happy New Year. Sunday is by far my favorite day of the week. I take the Lord's advice and let it be our day of rest and worship. It's the one morning I can sleep in a little, and then lazily cook a nice breakfast while sipping coffee and listening to a favorite CD (this morning it was a mix on pandora...love that website ). Whatever you do today, relax and enjoy every minute. Take a moment in the holiday madness to remember what the Season is all about. I then realized that my puny little wreath just wasn't cutting it and I started obsessing about finding a new wreath for our front door (you should know I do that a lot...obsessing....that's how many of my home projects come about...apparently it's my "process"). Anyhoo, I looove the Nester , and if you haven't discovered her blog yet you have been missing out BIG TIME. 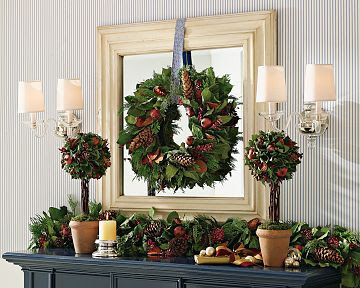 Anyhoo-hoo, I was studying her tutorial on garland making one day and thought "Hey, I can do this with a wreath!". Step 1: Get yerself a cheap skinny very fake pine wreath. I got mine 1/2 off of $8 at Hobby Lobby....that's $4 folks. Step 2: Wander over to the fake flower/greenery department and start browsing for some faux but real looking greenery that strikes your fancy. I bought some ferns, some berries, and some boxwood looking things....again, all for 50% off. Step 3: Put the goodies on the coffee table, put on that recorded episode of Oprah you haven't watched yet (well...it was actually General Hospital but Oprah somehow sounds less embarrasing) and start adding greenery little by little to your wreath. I started with a base of boxwood and then added the fern things and then the berries. I just kept adding until it felt "lush" enough. NOTE: the great thing about those fake pine wreaths is that the little pine branches are made out of WIRE...built in wire people! So I just wrapped a wire branch around each little sprig of fake goodness I added to the wreath. No floral wire or hot glue needed (see, I told you I can be lazy). Step 4: Get yourself a big fat ribbon in a color of your choice and hang your beautiful new creation on the front door. Step 5: Stand back and admire your lovely creation. Wouldn't it be nice to be one of those women? 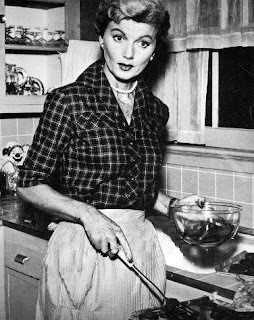 No...not Pamela Anderson...I'm talking about those women that have a clean house all the time, make gourmet meals for their family every night, and have breathtaking Christmas decorations up the day after Thanksgiving. Yeah, I'm not one of those women. I'm the other kind of mom. The kind that (gasp!) buys frozen meals that my son can pop in the microwave when I'm stuck at work late; The kind that has (again....gasp!!) dust bunnies hiding in the corners (in my opinion, a major drawback of hardwood floors...I hope you're still reading this post...I am getting to a point). And you know what?...I'm ok with being that kind of mom. My son knows I love him, and...really...does all the fluff and sparkle matter that much? That being said, I decided it would be better to put up imperfect Christmas decorations this year (in the spare hour I had to decorate) than to do nothing at all. For example, our beautifully sparse Christmas tree. I think it's pretty darn tranquil (if a tree can be tranquil). Here's a close up. I just love those beaded and glass snowflakes from Pottery Barn and Restoration Hardware (although, they failed me this year by not carrying them). My itty bitty garland and stockings (including a wee sock for our little pooch). And a few ornaments on the kitchen chandelier. NOTE: I've since seen a million photos of gorgeous decorated chandeliers. I've filed those photos away for next year's decorating. I am pretty proud of one of my creations, my voluptuous wreath that's now proudly displayed on the front door. Yep...I made her...for about $15. You can love her, hate her, feel indifferent towards her, but I'm pretty full of myself over this little creation. I hope you all relax and enjoy this wonderful holiday season!